How can I password-protect content? There are several ways you can protect content with WordPress. 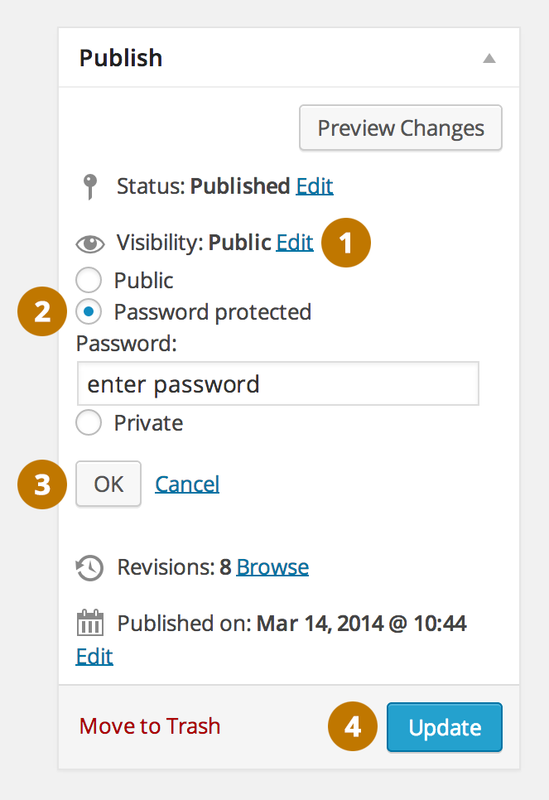 WordPress has a basic feature for password-protecting pages and posts. When adding or editing a page or post, click Edit by Visibility in the Publish box to set a password. See Using Password Protection for more information. Another approach is to set Visibility to “Private” which makes a page or post visible only to a logged in user (that you have added via Users > Add New). See Private Content on the WordPress Codex for more on this. You can search the Plugin Directory if you need something more sophisticated. There are several plugins for membership and “protected content” that you can try. We have not tested these so cannot make a specific recommendation.